WASHINGTON, DC -- With tensions flaring between Russia and the West, Vice President Joe Biden blasted Russian President Vladimir Putin Wednesday and said that the White House is still mulling sending arms and equipment to besieged Ukrainian troops. Biden criticized Putin for what he called "brutal aggression" in Ukraine, and said the Russian president was also responsible for "aggressive repression at home." Top military brass, including Defense Secretary Ash Carter and Chairman of the Joint Chiefs of Staff Gen. Martin Dempsey, have expressed support for transferring more weapons to Ukraine as it battles Russian-backed separatists in the eastern part of the country. But President Barack Obama, faced with skepticism from European partners, has so far resisted supplying Ukrainians with lethal aid. Some American officials have expressed concern that sending arms could escalate the crisis into a proxy war with Putin and have favored instead ramped-up financial assistance. Later on Wednesday, the U.S. announced an additional $18 million in humanitarian assistance for Ukrainians, bringing the total American contribution to $61 million. The State Department said 5 million people inside Ukraine need humanitarian aid, including disabled and elderly Ukrainians. 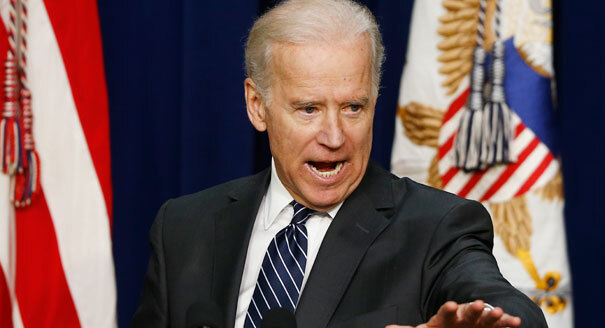 Biden, saying the debate over supplying Ukraine with weapons was "worth having," didn't shy away from using tough words against Putin in his address Wednesday to the Brookings Institution in Washington. Calling Putin's hard-fisted approach toward dissidents and gays "bullying," Biden said "Putin's vision has very little to offer the people of Europe, or for that matter the people of Russia, other than myths and illusions." But he noted that Russia and the U.S. have worked as partners in the ongoing negotiations with Iran over its nuclear program and said the U.S. was continuing to offer Putin "off ramps" to deescalate the Ukraine crisis. "We're not looking to embarrass him," Biden said. "We're not looking for regime change. We're not looking for any fundamental alteration of the circumstances inside Russia. We're looking for him to, in our view, act rationally." "The world looks different today than it did before he re-assumed the presidency" in 2012, Biden continued. "President Putin must understand as he has changed, so has our focus." As the vice president spoke, thousands of Russian troops were assembling in the country's northwest for a military exercise, just as European militaries were beginning similar exercises in the Arctic. Russia's move was met with disapproval by NATO, which said it was "concerned by the size, scale and frequency" of the military exercises. Obama, sitting alongside NATO's secretary general in the Oval Office on Tuesday, said Russia had taken an "increasingly aggressive posture" in Europe.